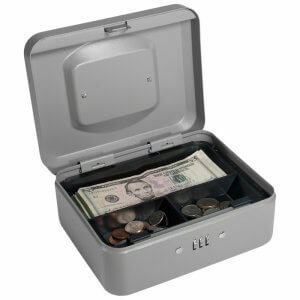 Barska offers a complete line of portable cash boxes from Barska. These cash boxes come in a variety of sizes, and are the perfect accessory for storing money during fundraisers and other events. 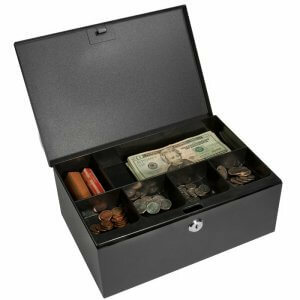 Most Barska cash boxes feature a pull-out tray that can be used to organize coin and small bills, and have space underneath to keep rolled coins, receipts, or larger denomination bills. A sheet steel construction ensures that the cash boxes cannot be tampered with and helps secure the valuables inside. Select models of portable cash lock boxes are available with either a traditional lock and key or a combination lock. 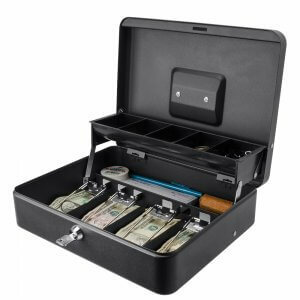 Each Barska cash box features a useful recessed fold down carrying handle for enhanced portability. With a variety of secure cash box options available from Barska, it is important review the different kinds of portable cash boxes in order to select the correct product. The following questions have been designed to help you find the right portable cash box to fit your needs. How many people will be granted access to the cash box? Barska portable cash boxes come with two different locking methods: traditional key lock and combination lock. If one or two individuals are allowed access to the lock box, then the traditional key lock would be the best fit. Two keys can be given to the authorized users to grant them access to the secure cash box. 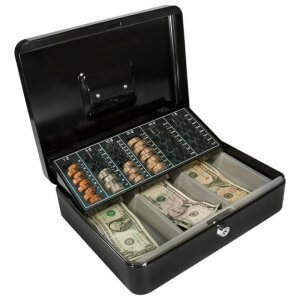 If more than one user needs to be granted access to the cash box then the combination lock cashbox would be a better fit. The 3-digit combination could be given to multiple authorized users without the need to locate a key. What kind of cash volumes will you be handling? For smaller cash transactions with a lower volume of money being exchanged, the extra small to medium cash boxes would be ideal. 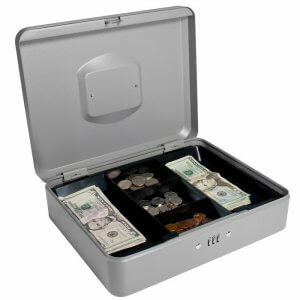 In situations where higher volumes of large cash transactions are taking place, one of the larger cash boxes with additional storage compartments would be a better fit. 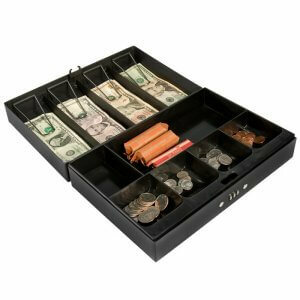 For example, the Cash Box with Coin Tray (CB11790) has a specialized coin organization tray that allows a merchant to quickly count change back to a customer. 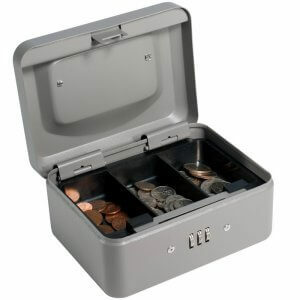 Sure Safe's top-selling cash box, the Barska Cash Box with Coin Tray and Key Lock (CB11790) provides the user with a variety of features to help make conducting cash transactions easier. The six section coin tray has columns for pennies, nickels, dimes, quarters, half dollars, and dollar coins with printed values next to each column for quick counting. This change tray angles up when the cash box is open for easier access to the coins and the bills below. 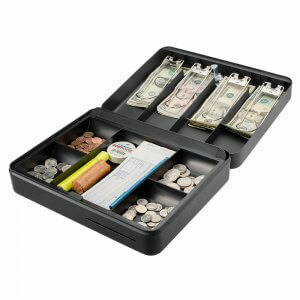 A removable three section lower tray can store cash, receipts, and other documents. Underneath the tray is storage room for coin rolls, spare bills, and additional items. 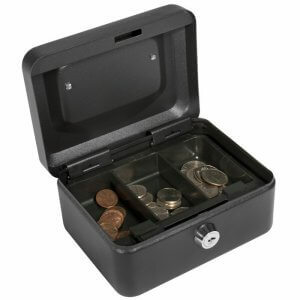 This cash box features a traditional key lock and comes with two keys. The compact dimensions and lightweight build of the Barska Portable Cash Boxes make them the perfect choice for users conducting on-the-go cash transactions. Whether being used for a craft fair, bake sale, fundraiser, or just to store petty cash at the office, the Barska line of portable cash boxes is the perfect way to keep money and other valuables safely secured. 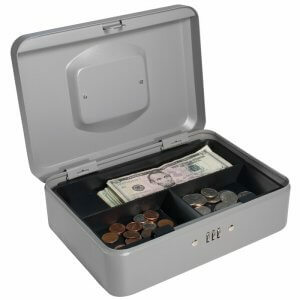 These cashboxes feature a steel construction and a durable locking system to deter tampering and provide added protection. 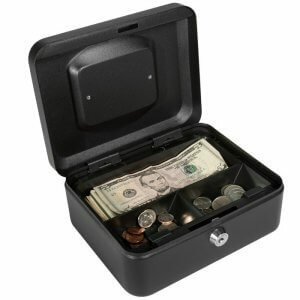 Due to their compact size, these handy cash boxes can be stored in a larger safe or drawer for additional protection. 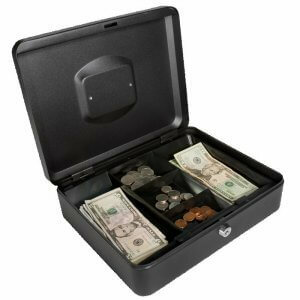 The entire line of portable cash boxes is constructed of durable sheet steel to provide years of use and protection. These steel cash boxes are resistant to tampering and can only be accessed by users who have the correct keys or combination. 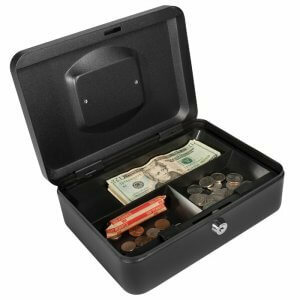 Bevelled edges provide the cash boxes with additional crush-proof protection and a durable carry handle makes transporting the cash box even easier.